The history of England is inextricably linked with the stories of its leading aristocratic dynasties and the great seats they have occupied for centuries. As the current owners speak of the critical roles their ancestors have played in the nation, they bring history alive. All of these houses have survived great wars, economic upheavals, and, at times, scandal. 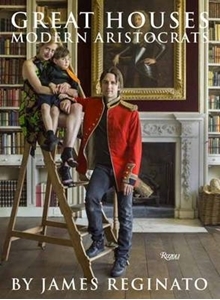 Filled with stunning photography, this book is a remarkably intimate and lively look inside some of Britain's stateliest houses, with the modern-day aristocrats who live in them and keep them going in high style. This book presents a tour of some of England's finest residences, with many of the interiors shown here for the first time. It includes Blenheim Palace-seven acres under one roof, eclipsing the splendor of any of the British royal family's residences-property of the Dukes of Marlborough; the exquisite Old Vicarage in Derbyshire, last residence of the late Dowager Duchess of Devonshire (nee Deborah Mitford); Haddon Hall, a vast crenellated 900-year-old manor house belonging to the Dukes of Rutland that has been called the most romantic house in England; and the island paradises on Mustique and St. Lucia of the 3rd Baron Glenconner. This book is perfect for history buffs and lovers of traditional interior design and English country life.